Courtesy of Satiro Sodré, SSPress/CBDA, Lago Paranoá, Brasília, Brazil. 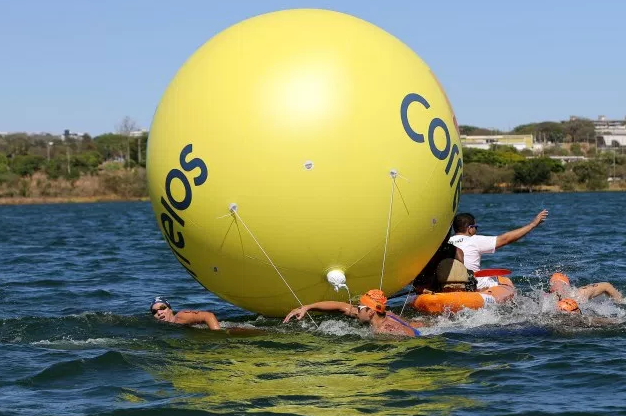 Within eight seconds, the top nine swimmers finished the Campeonato Brasileiro de Aguas Abertas in Lago Paranoá, an artificial reservoir in Brasília, on September 17th. Among the seven fastest men in the national Brazilian open water swimming championships, two top women (Ana Marcela Cunha and Viviane Jungblut) swam togther with the lead pack and ultimatelly finished right in the middle, a credit to their competitiveness, speed and stamina.